We live in a disposable culture, and for once, there is a sports franchise, smart enough and moral enough to say that no matter the stakes- a young man’s health trumps even a potential World Series trophy. The Washington Nationals will not risk sacrificing their once-a-generation talent on the altar of immediate gratification. And those calling the team “pathetic” and “disgraceful” reveal a win-now-at-any-cost mentality that for years has left a trail of broken arms and broken dreams. Nationals fans, by the way, have been accepting of the team’s position from the get-go. They saw how the team shut down Jordan Zimmermann last year, his first after returning from the same surgery as Strasburg, and they see how the young man is now a legitimate contender for a Cy Young award. Local surveys find National’s fans have few qualms about this approach. All the critics so outraged on our behalf, please spare us. It is true that there has never been a study of the careers of 24 year-old, 1st round draft picks and how they perform in the first year following Tommy John elbow surgery. Forget the surgery. There’s plenty of data about pitchers between the ages of 21 and 24 who have not undergone such surgery that shows the more they pitch, the more likely they are to blow out their arms or never return to their original form. See what the Chicago Cubs did to the careers of Mark Prior and Kerry Wood. Leo Mazzone, the former Atlanta Braves pitching coach who calls the National’s organization “pathetic” for wanting to shut down Strasburg, has nothing to be proud of in regard to how he overused a 21-year old pitching sensation named Steve Avery. To the point that by the time he got into his mid 20’s, Avery was a shadow of his former self and would never return to his early form. The way sports teams are built now, especially in baseball, there is precious little thought given to the construction of a franchise that can win consistently over a decade or more. For most General Managers, it’s a piece-meal approach accentuated by headline-grabbing trades in the Winter and desperation gambles at the end of July. This is not how the Washington Nationals have been constructed. They have a nucleus of largely home-grown young players who are under contract and will play together everyday for most of the next ten years. Their unexpected rise to the top of their sport this year is testimony to the sheer talent that has been assembled the old fashioned way; through wise scouting and careful draft selections. The critics who whine that this could be the Nationals last shot at a World Series don’t have a clue what they are talking about. Everyone knows the baseball playoffs are an utter crap shoot, anyway. But this is a team that is built to last and young Stephen Strasburg is the lynch pin of a starting rotation that could well dominate hitters year after year. I would wager a considerable sum this is not Washington’s only playoff appearance of the decade (and, of course, they’ve clinched nothing yet so it’s premature to assume just about anything). It’s also good business to shut down Strasburg. How many future Strasburg’s out there will ever forget how this team treated, respected and treasured the health of their young star? Next time Nat’s General Manager, Mike Rizzo, sits down at a kitchen table with the father of a young man he wants to draft for the club, those won’t be empty promises he’ll be giving about protecting the health and career of his son. It will be a fact guided by history. But what about the poor players who expect management to field the strongest possible team for any drive to a world title? 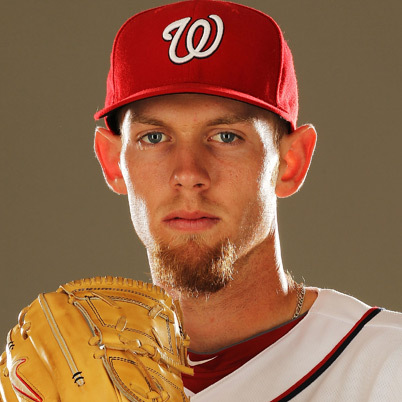 Well, first of all, the Washington Nationals are much, much more than Stephen Strasburg. Eliminating all of his stats, Washington’s pitching staff would still have the best ERA in the game. Secondly, the Nationals have overcome the absences of other players important to the franchise, including Ryan Zimmerman, Michael Morse, Drew Storen, Jason Werth, Ian Desmond, Adam LaRoche and Wilson Ramos. This has always been a team bigger than any of its individual parts. I also believe the players will take the Strasburg shutdown as a challenge and will be highly motivated to rise to the occasion. He will certainly be in their hearts and minds and I would not be at all surprised to see them dedicate their playoff drive to the young and absent pitching sensation. As there will be no real way to tell if the team was right or wrong about the Strasburg shutdown, there are a few ways the Nationals can have the last laugh here. They need to win the World Series this year without him. And then they will have to win one with him. How’s that for a lofty set of goals? It would well be worth it- not only for the sake of Washington’s historically beleaguered franchise, but also for the rich comfort of being able to tell all those ESPN blowhards and pitching coaches who have disposed and ruined so many young arms in the past, that they were wrong. Wrong on the facts. Wrong on the morality and the ethics. And wrong about the humanity and the business of baseball.